Many books have been written in recent years about our brains—how they evolved, how they work, how they often fail us, how they sometimes serve us in a blink with little effort, and how they differ from the brains of other animals. Neuroscientists and psychologists in particular have fascinated us with advances in our understanding of the human brain. This emerging understanding reveals a challenge that we must face and overcome to preserve our species. Our brains evolved primarily to survive as hunter-gatherers on the African savannah, which was straightforward and simple. Not simple in that it was easy, but simple in that the problems that we faced were not difficult to understand. The automatic, intuitive, fast, and emotional types of thinking that made us successful in that world—sometimes called System 1 or Type 1 thinking—served us well for millennia. Something began to happen, however, when changes in our brains led to tool making and social cooperation, which gave birth to a cultural revolution. We went from living in small bands on the African savannah to living in larger groups throughout the world. That revolution, which coincided with expanding cognitive abilities that are deliberate rather than automatic, cognitively demanding rather than intuitive, slow rather than fast, and rational rather than emotional—sometimes called System 2 or Type 2 thinking—not only gave us greater ability to adapt to the world but also an ability to shape the world. The result is a world, unique to humans, that is complex. This complexity of our own making has made our lives challenging. And, because we usually try to deal with this complexity using the System 1 thinking that isn’t equipped to deal with it, we have made mistakes along the way that threaten our very existence, such as the damage to our environment that is a by-product of industrialization and the potential for mass destruction that is made possible through science and the technologies that it has produced. Learning to use System 2 thinking to solve complex problems is the fundamental challenge of our age. 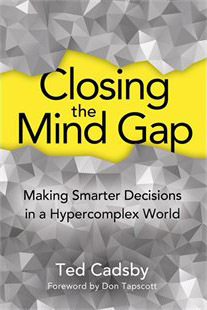 In his book, Closing the Mind Gap: Making Smarter Decisions in a Hypercomplex World (2014), Ted Cadsby ties together the threads of understanding that are needed to meet this challenge. Ted Cadsby is not a neuroscientist or a psychologist. He is a former banking executive with an MBA, seasoned with training in philosophy, who now works as a researcher, writer, and speaker on complexity and decision making. As such, his interest and work in decision making is not just theoretical. He is intimately familiar with the types of problems that we face day to day in our lives and especially in our work. In Closing the Mind Gap, by drawing on the work of many researchers from various disciplines, he’s managed to weave together into a coherent whole an understanding of the gaps that exist between our System 1 thinking abilities and the complex problems that we face, along with the steps that we must take to develop and apply our System 2 thinking abilities to solve these problems. In Part I, “Brains Coming into the World,” he describes how our brains evolved and the ways in which our cognitive abilities are bounded. In Part II, “Brains Sorting out the World,” he describes how our brains work—how System 1 thinking simplifies and satisfices in ways that served our ancient ancestors well and continue to serve us well when facing easy, day-to-day decisions, but how simplifying and satisficing fail when faced with complexity. In Part III, “The Brain-World Problem,” he explains that we live in two worlds: World 1, which is simple and easy to navigate using intuitive System 1 thinking, and World 2, which is complex and therefore beyond the reach of intuition. In Part IV, “The Brain-World Solution,” he explains that Systems Theory, the scientific method, and statistical thinking enable “metacognitive thinking”—a form of System 2 thinking—to deal with complexity. In Part V, “Brains and People,” he explains how complexity in our selves (psychology) and complexity in others (sociology) complicate the struggles that we face. This book consolidates and articulates a great deal of content that you could find elsewhere in greater detail, but with much more time and effort. As I was reading it, it felt a little repetitive at times, but that might have been because I’m well read in this subject matter. I recommend this book to anyone who engages in complex decision making or supports those who do. This should be required reading for anyone who is embarking on a career in analytics. Even if you’ve been doing data analysis for years, this book will help you rebuild a foundation for analytical thinking that will make you a better analyst. It’s never too late to strengthen your skills in fundamental ways. Thanks for highlighting this book, and for your embryonic “A Course of Study in Analytical Thinking” paper (where I first noticed you reference) it. Having browsed your suggested reading for that hypothetical course, Ted Cadsby’s book was one notable exception from my own reading (it and the Stephen Carey title), and I don’t think I would have chanced upon it without your highlight. As you observe, much of the material within “Closing the Mind Gap” has been covered elsewhere in greater depth, but as a definite ‘jack-of-all-trades’ rather than a master of any, I found Cadsby’s concise style highly effective in tying many related themes together and a pleasure to read. Yes, several points are repeated (some repeatedly! ), but that often serves to reinforce important overlapping concepts (e.g. availability bias and conformation bias). I strongly echo your advice to anyone and everyone in an analytical role (or the management thereof) to read this book. I have already asked my team to read, digest and comment and will be recommending to every client who asks for “one version of the truth” or grabs the first piece of confirmatory evidence for every hypothesis.